This is a recipe passed to me years ago by my 93 year old mother-in-law. She used to knock up these biscuits for my boys when they came home from school, or make a batch to go with fruit and ice-cream for our Sunday dessert. I made them today to accompany strawberries and whipped cream. I know it’s only April and the temperature outside makes it feel more like March, but the strawberries in Waitrose looked so beautifully red and plump, I couldn’t resist buying them. They did not disappoint. These biscuits are buttery, short and light and couldn’t be easier to make. There is nothing sadder than an Aga which isn’t on. Today my Aga has been cold and consequently – I know it’s silly, especially since it’s summer, allegedly – my kitchen seemed a rather uninviting place. The Aga was turned off last night to give it a chance to cool down before its annual service today. It’s just been switched back on and with a bit of luck will have enough heat for me to cook supper on it tonight. Some Aga owners (sensibly) turn theirs off during the summer months and use their alternative oven. The trouble is, I don’t have an alternative oven. 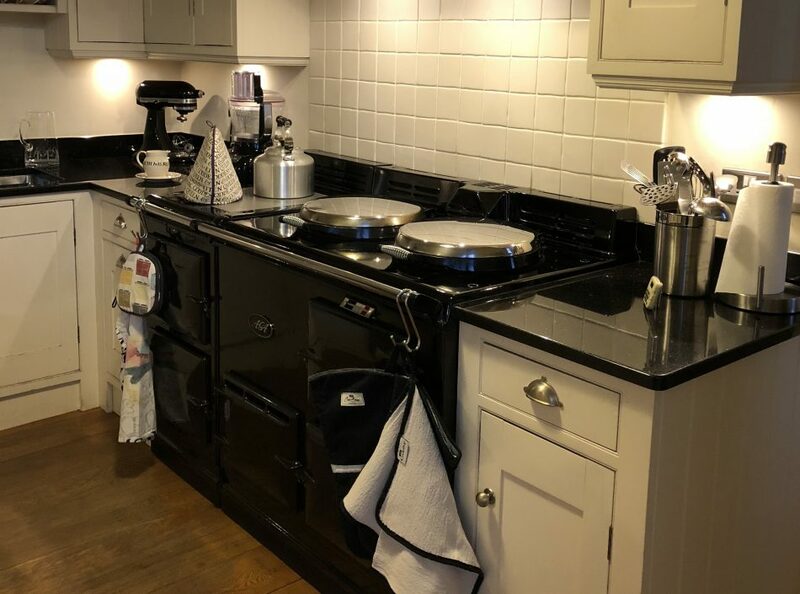 It was a deliberate decision when we had the Aga installed in our new kitchen ten years ago to be a full-time Aga cook and also not to use up space unnecessarily; instead, I have plenty of cupboards! Admittedly it can feel too hot if ever we have a spell of proper summer weather (ie not often) but our Victorian house has large sash windows which can be opened wide, and also, the Aga can be turned down and still be used. It’s a pity the Aga service hasn’t coincided with some really hot weather like we had a couple of weeks ago, when it would have been a relief to have a cooler kitchen. It’s grey and wet out there but mild: it’s definitely summer rain we’re experiencing. Still, it doesn’t mean I can’t tell you a little about what I’ve been making in the kitchen lately. It’s the season for salad and soft fruit, neither of which necessarily requires cooking. A delicious salad in my new favourite book, Honey and Co., is fatoush. As far as I can tell, there exist many versions of it, but this is the first one I’ve come across which includes pomegranate. If I was making it today I’d have to add the pitta without toasting it, because I don’t have an electric toaster. At the 21st birthday party we went to recently, our hostess served this strawberry dessert which was absolutely delicious. This is not a precise recipe; I’ll leave you to adjust quantities to your liking. Hull and halve or quarter your strawberries, depending on size, and place in a bowl with some sugar and balsamic vinegar. I used a couple of tablespoons of balsamic and just a sprinkling of caster sugar for about 600g strawberries. Leave these to infuse for a couple of hours. Apologies for not having a photo of this dessert but here are some strawberries anyway.